The original source recording for this restoration was in very good condition for its era - noise levels were relatively low, there was a full range frequency response, and drop-outs were few and far-between. I've been able to largely tame the occasional light radio static, though it may remain just audible at times. 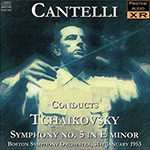 The recording did require some considerable re-equalisation to correct a particularly heavy boost in the treble; that aside the applause was quite abruptly cut - fortunately I had a slightly longer section of applause from the same concert which I was able to mix in to the end of this recording to provide a more satisfactory conclusion to a really excellent performance.